The Torah instructs us that the proper kashering method used to rid a vessel of chometz is dependent upon the original method of food preparation through which chometz was absorbed into the vessel. When possible, it is preferable for a person knowledgeable in the laws of kashering to be present during this kashering process. Kashering must be finished before the latest time to burn the chometz (see here). If kashering was not done before this time, consult your rav. For Kashering Safety Tips from Hatzalah, see here. Metal utensils used in the oven for baking must be heated to a glow, if they are to be used during Pesach. The stove must also be kashered if it is to be used during Pesach. This includes the oven, cooktop, and broiler. No part of the stove can be considered kashered for Pesach unless it is completely clean and free from any baked-on food or grease. In a conventional oven, whether gas or electric, an oven cleaner may be necessary to remove baked-on grease. Be sure to check hidden areas including corners, door edges, the area behind the flame burners, and the grooves of the rack shelves. If a caustic type of oven cleaner (such as Easy-Off) was used to clean the oven, and some stubborn spots remained after a second application with similar results, the remaining spots may be disregarded. Once the oven and racks have been cleaned, they may be kashered by libbun kal. The requirement of libbun kal is satisfied by turning the oven to broil, or the highest setting, for 40 minutes. In a gas oven, the broil setting will allow the flame to burn continuously. In a conventional electric oven, the highest setting (550°F) kashers the oven. Only libbun kal is required for the oven racks, since it is usual to cook food in a pan and not directly on the racks themselves. In a continuous cleaning oven, one cannot assume that such an oven is clean based solely on the manufacturer’s claims; a visual inspection is required. Since caustic or abrasive oven cleaners (e.g., Easy Off) cannot be used without destroying the continuous clean properties of the oven, a non-abrasive and non-caustic cleaner must be used to clean the oven. Grease spots will usually disappear if the top layer of grease is cleaned with Fantastik and a nylon brush. The oven should then be turned on to 450°F for an hour so that the continuous clean mechanism can work. If the spots do not disappear, the oven should be left on for a few hours to allow the continuous clean mechanism to deep clean; otherwise, the spots should be removed with oven cleaner or steel wool. If the spots are dark and crumble when scratched they can be disregarded. In all of the above cases, the oven should then be kashered by turning it on to the 550°F setting for 40 minutes. In a self-cleaning oven, before using the self-clean cycle, one should clean the inside face of the oven door as well as the opposing outer rim of the oven outside the gasket, since these areas are not necessarily cleaned during the cycle. One should ensure that the gasket itself is clean on the area outside the oven seal. (Note: The gasket is sensitive to abrasion.) The self-cleaning cycle will then clean and kasher the oven simultaneously. Caution: There is a potential risk of fire during the self-cleaning process, especially if there is a build-up of grease on the bottom of the oven. It is recommended that one apply Easy Off, made especially for self-clean ovens, to lift and remove the grease. The oven should not be left unattended while in the self-cleaning mode. Due to reports of potential fires, one should not leave other operating heating appliances (i.e., dryers, toasters, coffee makers, toaster ovens, microwave ovens, or dishwashers) unattended. In fact, toasters and toaster ovens should be unplugged (by pulling on the plug and not the cord) when not in use. Most oven manufacturers instruct the consumer to remove the oven racks before self-cleaning so they will not discolor. However, one may self-clean the oven with the racks inside even though they might discolor. After the self-clean cycle, one should use a little oil on the side of the racks to easily slide them in and out of the oven. There are some manufacturers that also require removal of the racks before the self-clean cycle can start. In this case, one should take the racks out, clean them very well, and then put them in the oven at the highest temperature (usually 550°F) for 40 minutes. This procedure kashers the racks. Some ovens come with a convection feature. This feature allows for more uniform heat distribution by using a fan to circulate the heat. If the convection oven has the self-cleaning feature it will be sufficient to also kasher the fan using the self clean kashering method previously mentioned. If there is no self-cleaning feature, the entire oven including the fan, while it is circulating, must be sprayed with a caustic cleaner and cleaned well. The oven should then be kashered by turning it on to the 550°F setting for forty minutes. Please note that many ovens today have “Aqualift” or Steam Clean instead of a conventional self-cleaning feature. Neither Aqualift nor Steam Clean get hot enough to kasher the oven. Instead, use the “conventional oven” kashering method as described above. On a conventional gas range, the cast iron or metal grates upon which the pots rest may be inserted into the oven after they have been thoroughly cleaned. The grates can then be kashered simultaneously with the oven. (If kashering with a self-clean cycle, the grates do not need to be cleaned first. However, it is advisable to check with the manufacturer as to whether the grates would be able to withstand a self-clean cycle. Some grates have rubber feet that may be damaged by the heat of the oven or may damage the oven itself.) Note: The self-cleaning cycle may remove the paint finish if the grate is not manufactured to withstand the self-clean cycle. The rest of the range (not glasstop) should be cleaned and covered with a double layer of heavy duty aluminum foil, which should remain on the range throughout Pesach. Please Note: Extreme caution should be taken not to cover over the vent so as to allow the oven heat to escape. The drip pans should be thoroughly cleaned and need not be kashered. The burners do not require kashering or covering but should be cleaned. In a conventional electric cooktop, one is required to clean the burners well and then turn them on to a high heat setting until they are glowing hot. (This usually takes only several minutes.) The drip pans should be thoroughly cleaned and need not be kashered. The remaining cooktop areas should be cleaned and covered. The knobs with which the gas or electricity is turned on should be cleaned. No other process is necessary to kasher the knobs. Please Note: All ovens ventilate hot steam during cooking. In the past, the hot steam was ventilated through the back of the oven. Today, many ranges no longer ventilate in this manner. The oven steam is ventilated through one of the rear cooktop burners. During oven cooking, if the rear vented burner is turned off and covered by a pot or kettle, the hot steam will condense on the burner and utensils. This could create hot zea (condensate) that can cause serious kashrus problems with the utensil if the food cooked in the oven is a meat product and the pot on the burner is dairy or pareve, or vice versa. Care should be exercised with the vented burner to keep it clear during oven cooking. Caution: When placing aluminum foil over the oven backsplash, be careful not to trap the heat coming from the oven vent between the foil and the backsplash; doing so may melt the backsplash if the oven vents through the back. Kashering a glass-ceramic cooktop for Pesach use is a bit complex. To kasher the burner area, one should clean it well and turn on the elements until they glow. The burner area will then be considered kosher for Pesach. However, the remaining area that does not get hot is not kashered. The manufacturers do not suggest covering this area as one would a porcelain or stainless steel top, as it may cause the glass to break. Real kosherization can be accomplished by holding a blowtorch over the glass until it is hot enough to singe a piece of newspaper upon contact with the glass. However, this may cause the glass to shatter and is not recommended. For gas stovetops with a glass surface, one may kasher the grates by putting them into the oven with libbun kal (550°F for 40 minutes). In most such models, the grates cover the entire top of the stove and there should be no problem adjusting pots on the stovetop. Food which falls through the grates and touches the glass surface should not be used. For those models where the grates do not cover the entire cooktop surface it would be wise to place a trivet on the open glass area so that pots may be transferred. No food or pots may come into direct contact with the non-kashered glass surface. Some gas cooktops have an electric warming area on the glasstop. In order to kasher this area, it would have to become red hot when turned on. Many of these warming areas do not become hot enough for kashering and may not be used on Pesach. Broiler – The broiler pan cannot be kashered by merely turning on the gas or electricity. Since food is broiled or roasted directly on the pan, the pan must be heated to a glow in order to be used during Pesach. This can be done by using a blowtorch (which should be handled by qualified and experienced individuals only). An alternative method is to replace the broiler pan. The empty broiler cavity must then be kashered by cleaning and setting it to broil for 40 minutes. If one does not intend to use the broiler, one may still use the oven even without kashering the broiler, provided that the broiler has been thoroughly cleaned. Other inserts such as griddles, which come into direct contact with food, are treated the same as broiler pans. Therefore, they would also require application of direct heat until the surface glows red. Otherwise, the insert should be cleaned and not used during Pesach. Barbecue Grills – A grill cannot be kashered by simply turning on the gas or electricity. Since food is roasted directly on the grill, it must be heated to a glow in order to be used. This can be done by sandwiching the grates between the charcoal briquettes and setting them on fire. An alternative method is to replace the grates of the grill. The part of the grill cavity which is level with the grate must also be kashered by heating it to a glow. This is due to the likelihood of food having touched that area during barbecuing. The empty gas grill cavity (and the hood) must be kashered by cleaning, closing the hood, and setting it to the highest setting for 40 minutes. In the case of a regular grill, the cavity should be filled with charcoal briquettes which should be set on fire. Other inserts such as griddles, which come into direct contact with food, are treated the same as a grill and would, therefore, also require application of direct heat until the surface glows red. Otherwise, the insert should be cleaned and not used during Pesach. If the grill has side burners they should be treated like cooktop grates, assuming no food has been placed directly on them. Practical Tip: It is easier to determine that the metal has been brought to a glow in a darkened room. Warming Drawers – Warming drawers cannot be kashered because the heat setting does not reach high enough to constitute libbun. The warming drawer should be cleaned, sealed, and not used during Pesach. Oven Hoods and Exhaust Fans – Hoods and exhaust fan filters should be cleaned and free of any food residue. Microwaves – When microwaves are used, they do not necessarily absorb chometz. The microwave should be tested to see if the walls become hot during use. To do this, one should cook an open potato in the microwave until it has been steaming for a few minutes. Immediately after the potato has been cooked, one should place his hand on the ceiling of the microwave to see if it has become too hot to touch. If one cannot hold his hand there for 15 seconds, we assume that the microwave has absorbed chometz. If this is the case, the microwave should be cleaned and sealed for Pesach. If it has not absorbed chometz (i.e., one can hold his hand there for 15 seconds), the microwave itself needs only to be cleaned well. It is recommended that one wait 24 hours before using the microwave on Pesach. The turntable should be replaced because it has come into contact with hot food and would not pass the hand test. One may replace the turn table with a ¼” Styrofoam board. Microwave ovens that have a convection or browning feature must be kashered using the convection and/or browning mode. The kashering method used would be libbun kal. The convection microwave should first be cleaned well. If the fan area cannot be properly cleaned, it should be sprayed with a caustic cleaner (e.g., Easy Off) while the fan is on, and rinsed off before kashering. One should then test the convection microwave to see if it reaches the required heat for libbun kal by putting it on its highest setting for 40 minutes. A piece of paper should then be held against the interior wall to see if it gets singed.1 If the paper is singed, the convection microwave has been heated sufficiently for libbun kal and can be considered kashered. Many models fail the test because their settings do not allow the microwave to become hot enough for kashering. If this is the case, the microwave should be cleaned, sealed, and not used during Pesach. Metal utensils (i.e., stainless steel, cast iron, aluminum, etc.) that have been used for cooking, serving or eating hot chometz may be kashered. This may be done by cleaning the utensils thoroughly and waiting 24 hours before immersing them, one by one, into a kosher for Pesach pot of water heated to a rolling boil; a rolling boil should be maintained when the vessel is immersed. The metal utensil or vessel should be submerged into the boiling water for about 15 seconds. The utensils undergoing the kashering process may not touch one another. In other words, if a set of flatware is being kashered for Pesach, one cannot take all the knives, forks and spoons and put them into the boiling water together. Each of these items should be placed into the boiling water separately. Kashering Tip: Loosely tie the pieces of silverware to a string, leaving three inches between each piece, and immerse the string of silverware slowly, making sure the water keeps boiling. The process is finalized by rinsing the kashered items in cold water. If tongs are used to grip the utensil, the utensil will have to be immersed a second time with the tongs in a different position so that the boiling water will touch the initially gripped area. Unlike tevilas keilim, the entire utensil does not have to be immersed in the boiling water at once; it may be immersed in parts. A non-kosher for Pesach pot may also be used, l’halacha, for the purpose of kashering if it is clean and has not been used for 24 hours. However, it is customary to make the pot kosher for Pesach before using it for kashering. This is accomplished by cleaning the pot, both inside and out, and leaving it dormant for 24 hours. The pot should then be completely filled with water and brought to a rolling boil. Using a pair of tongs, one should throw a hot stone or brick into a pot that has been heated on another burner. The hot rock will cause the water to bubble more furiously and run over the top ridge of the pot on all sides at one time. (One should use caution, as the hot water may spray in all directions.) The kashering process is finalized by rinsing the pot in cold water. The pot may now be refilled, brought to a boil, and used to kasher the chometz utensils. It is a minhag to re-kasher the pot after kashering. Extra Bonus: After this kashering process has taken place, the status of these newly kashered utensils may be changed from milchig to fleishig, vice versa, or pareve. Sinks are generally made from either stainless steel, granite composite, china, porcelain enamel, steel, or other man-made materials such as Corian. Stainless Steel Sinks can be kashered using the following method: Clean the sink thoroughly. Hot water should not be used or poured in the sink for 24 hours prior to kashering. It is recommended that the hot shut-off valve under the sink be turned off 24 hours before kashering. The sink should be dry before kashering. Kashering is accomplished by pouring boiling hot water from a Pesach kettle/pot over every part of the stainless steel sink. Tip: If a roasting pan is filled and heated, the pouring surface is much wider than a kettle spout. It is not sufficient to pour water on one spot and let it run down the sink. The poured water must touch every part of the sink, including the drain and the spout of the water faucet. It is likely that the kashering kettle will need to be refilled a few times before kashering can be completed. After kashering, the sink should be rinsed with cold water. If hot water was accidentally used in the sink during the 24 hour dormant period, and there is not enough time before Pesach to leave the sink dormant for an additional 24 hours, a shaila should be asked. China sinks cannot be kashered. These sinks should be cleaned, not used for 24 hours, and completely lined with contact paper or foil. The dishes that are to be washed should not be placed directly into the sink. They must be washed in a Pesach dish pan which sits on a Pesach rack. 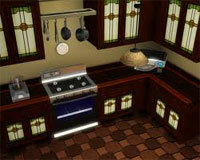 It is necessary to have separate dish pans and racks for milchig and fleishig dishes. Porcelain, Corian or Granite composite sinks should also be considered similar to a china sink, since there is a controversy as to whether these materials can be kashered. Granite composite is a material fashioned from granite and plastic. Most sinks that look like granite are actually granite composite. Countertops – Silestone, Porcelain Enamel, Corian, Quartz, Plastic/Formica and Granite Composite countertops cannot be kashered; they should be cleaned and covered. To place hot food and utensils on these countertops, cardboard or thick pads must be used to cover the counter. Corian is also a form of plastic that cannot be kashered. Since the chometz penetrates only a thin layer of the counter, it can be sanded down to take off a layer of Corian (the thickness of a piece of paper). It then is considered Kosher for Pesach. However, only a qualified contractor should attempt this procedure. Pure Granite (not granite composite), Marble, Stainless Steel, or Metal may be kashered through eruy roschim. Wood may also be kashered through eruy roschim if it has a smooth surface. In pre-war Europe, where glass was expensive and hard to obtain, it was customary to kasher drinking glasses by immersing them in cold water for three periods of 24 hours. This is accomplished by submerging the glasses for one 24 hour period. The water should then be emptied, refilled and allowed to sit for another 24 hours. The procedure should be repeated a third time, for a total of 72 hours. This method of submerging cannot be used for Pyrex or glass that was used directly on the fire or in the oven. In general, kashering glasses is recommended only in cases of difficulty. Wherever glasses are readily available for purchase, special glasses for Pesach are preferable. Arcoroc and Corelle should be treated similar to glass for kashering purposes. It is important to note that where libbun kal helps, certainly libbun gamur is good; where hagola helps, surely libbun kal is good; where eruy helps, certainly hagola and libbun help. אע”ג דהשיעור של קש נשרף עליו הוא אמבחוץ וכאן הוא מבפנים, י”ל דבתנורים שלנו א”א להבחין אם נשרף עליו מבחוץ, שהחוץ אינו של דופן התנור. שיש לתנור שני כותלים וביניהם חומר המקיים את החום, וא”א להגיע לבחוץ של כותל הפנימי. ונ”ל שכשפותחים את התנור ונכנס אויר קר לתוך התנור, אז הכותל הפנימי מבפנים הוא יותר קר מכותל הפנימי מבחוץ שמכוסה מכל הצדדים.